Hello lovelies! I'm back with a nice summery look as part of a review for new nail art brand Nicole Diary. They recently contacted me offering 3 stamping plates of my choice to review. I chose three gorgeous plates, one of which I have to show you today. 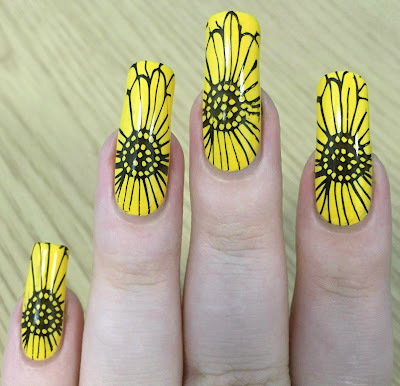 The sunflower image on that particular plate was the first to catch my eye, and I ended up using it for the design below. As always, read on for more info! I started off with a base of OPI 'My Twin Mimmy' from the Hello Kitty Collection (swatched here). I thought the rich yellow would be a perfect sunflower colour. Below is three coats and topcoat. Before I get into the stamping, here is a look at the plate itself (ND106). The square plates measure 6 x 6cm, so actually have quite big patterns on. I love the size as I do have issues finding designs long enough for my nails. Each plate came with a blue protective film and a small cardboard sleeve for storage. I stamped the top right flower pattern onto all of my nails. I used Hit The Bottle 'As Black As Night' and my MoYou London squishy rectangular stamper. The plate is very well etched and I had no issues at all picking up or transferring the design. After waiting a few minutes to avoid smudging, I added a quick topcoat to seal in my flowers. What do you think? I have to say I'm really impressed! I found the plate so easy to use, and you can see how clearly the design has transferred. Again, I really love the bigger size of the patterns - I don't have to worry at all about them fitting my nails. Keep an eye out for more nail art using Nicole Diary plates soon! You can find Nicole Diary on Instagram here and Amazon here. Their plates are currently only $1 each, with free shipping. 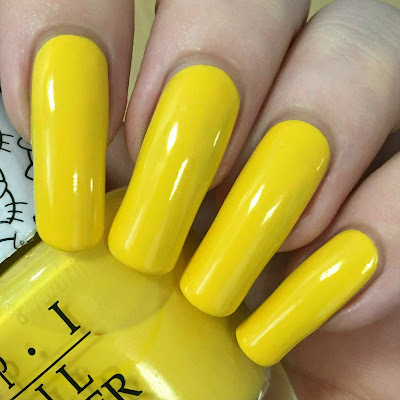 Pretty design and great yellow polish! I love the design and the square plate. Great review of a new brand! 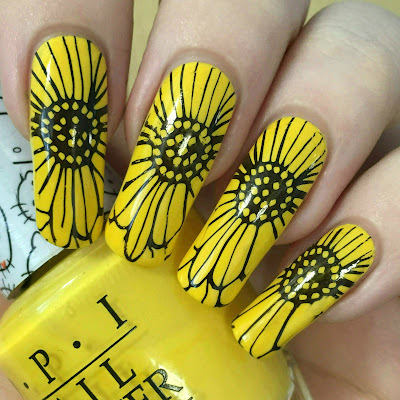 I really like the black over the yellow for the flower. The plate looks higher quality than a lot of other foreign brands, stamped great too. WOW, i really like this gorgeous yellow nail polish and not even to mention your lovely long nails! (I'm drooling here) The sunflowers looks really great! Great photos! I love this mani! Perfect design for long nails!